The start of a season is a good time to review some of the basics. And the first one is the role of a swimming parent. I should warn you here that I’ll be repeating some points I made in a similar post almost exactly one year ago. Before I start, I should point out that swim parents are actually pretty good when it comes to interacting with their kid’s competitors, officials and coaches, at least in comparison with other sports. In fact, swimming didn’t show up in any of the top 10 list I could find for worst sports parents. And this makes sense. Swimmers can’t hear parents during competitions, when the worst behaviours come out. And we don’t have an official that controls the course of the competition the way so many other sports do. But just because we don’t see baseball/hockey parent type physical attacks in the stands, or hear vicious verbal abuse of officials, coaches and opposition, doesn’t mean that swimming parents aren’t a problem. 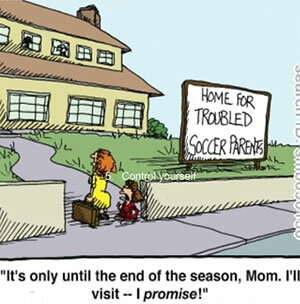 Ask pretty much any coach and they’ll tell you that parents are the worst part of their job. Most teams are run by volunteers, and we need help to provide the complete program. Many volunteer positions require very little time, or are only required a few times a year. And many of you have expertise that can be an incredible help. 5) You are probably driving your kids to practices and meets. So please be on time. In fact, please be 10 minutes early. Late pickups after practice is even more important. Please do not leave the swimmer alone for extended periods of time after practice, and especially if its dark out, or the facility is not crowded, or even closed. We had a huge problem last year with a few parents being up to an hour late picking up their children. This year, we’ve had to instruct our coaches to leave immediately after any post-practice chats. We are not babysitters, and we are NOT responsible for your children once they leave the pool deck. It’s now been one year since I wrote that Swimming Canada is far behind the ball in terms of providing useful information to swimming parents. And not a single thing has changed in the last year. The section on Parents on the swimming.ca site has a very brief but useful primer for swimming illiterate parents, and a mind-numbing, generic and ultimately ineffective Sports Parent’s Guide to Long TermAthlete Development . For a national sports organization, this is an embarassment.